Object of the rubbing. The supermarket shot shows Chicken Rub and Pork Rub, and (1) has Steak Rub as well — all N+N compounds in which the first element refers to the food on which the spices are rubbed. This is a canonical sort of N + N compound, parallel (except for the semantic complexity of rub) to compounds like linguistics book ‘book on linguistics’. Characteristic location/source of the rub. Roughly paraphrasable as ‘a rub in the manner / fashion of this location / source’. This analysis applies to some of the act nouns, notably Princeton rub, but also to complex cases … alluding to [hand jobs performed in the manner of] Memphis, Texas, and Tennessee. You need to supply some considerable cultural knowledge to make full sense of these cases. … Of course, cowboy rub could also be a (sexual) act noun, referring to masturbation or frottage the way cowboys do it, or the way it’s done on cowboys. All sorts of cowboy casseroles. As it turns out, ideas about cowboys and their tastes in casseroles vary quite a bit, in part because the cowboys in question are not actual human beings but mythic characters embodying legends of the American West (on the range) and also cultural ideals of working-class masculinity. Some contributions from these sources: meat (especially beef) as manfood and also range food; beans and corn as characteristic range food; chili (in one manifestation, a stew of chili peppers, ground beef, tomatoes, and beans) as the quintessential manfood; and potatoes and bread as manfood accompaniments to main dishes. “I’m a meat-and-potatoes man”, as they say. A casserole (French: diminutive of casse, from Provençal cassa “pan”) is a large, deep pan used both in the oven and as a serving vessel. The word is also used for the food cooked and served in such a vessel, with the cookware itself called a casserole dish or casserole pan. … In the United States and continental Europe casseroles usually consist of pieces of meat (such as chicken) or fish (such as tuna), various chopped vegetables, a starchy binder such as flour, rice, potato or pasta, and often a crunchy or cheesy topping. Liquids are released from the meat and vegetables during cooking, and further liquid in the form of stock, wine, beer (for example lapin à la Gueuze), gin, cider, or vegetable juice may be added when the dish is assembled. Casseroles are usually cooked slowly in the oven, often uncovered. They may be served as a main course or a side dish, and may be served in the vessel in which they were cooked. Putting the schema for cowboy food together with the schema for casseroles allows for a wide spectrum of things that might count as a cowboy casserole, and actual recipes seem to come from all over this spectrum. Three examples here, starting with the one from Pinterest. Crock Pot Cowboy Casserole is a hearty meal and combines all of our favorite ingredients into one dish. I knew this snowy weekend would be a perfect time to create a Crock Pot meal the whole family would love. Preheat oven to 375°. In a large skillet, cook beef over medium heat until no longer pink. Stir in the corn, soup, 1/4 cup cheese, milk, sour cream, onion powder and pepper. Place 1 cup Tater Tots in a greased 3-cup baking dish. 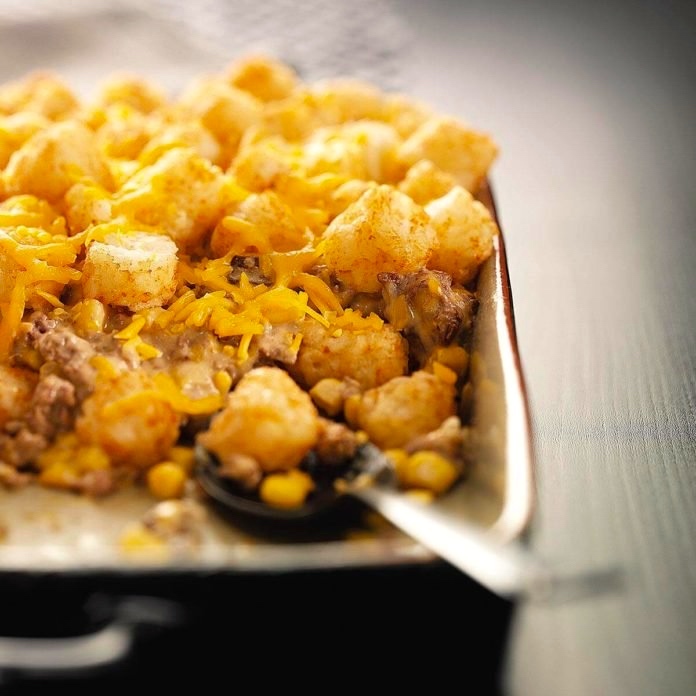 Layer with beef mixture and remaining Tater Tots; sprinkle with remaining cheese. Bake, uncovered, 20-25 minutes or until bubbly. 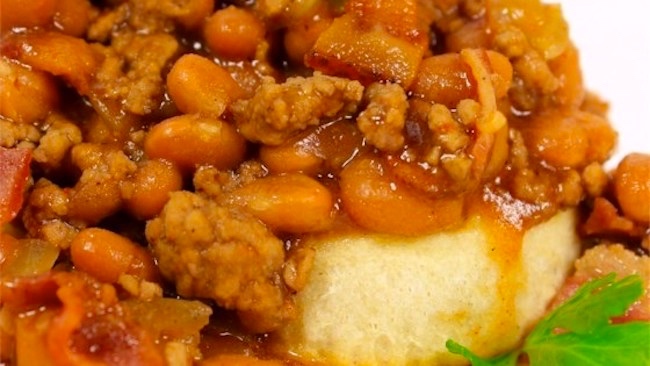 This combination of hamburger, beans, and bacon over biscuits will bring out the cowboy in anyone. It has become a family favorite. It is so easy to make, and we love to make it when we’re camping. Cook bacon in a large skillet or Dutch oven over medium heat until evenly browned. Drain, and cut into bite size pieces. Set aside. Add hamburger and onion to the skillet, and cook until no longer pink, and the onion is tender. Drain. Stir bacon, baked beans and barbeque sauce into the ground beef, and bring to a boil. Reduce heat to medium low, and place biscuits in a single layer over the top of the mixture. Cover, and simmer for about 10 minutes, or until the biscuits are done. Place two biscuits on each plate, and spoon beans over. It’s unclear to me how the family manages to bring refrigerated biscuit dough on their camping trips. This entry was posted on February 4, 2019 at 9:36 pm and is filed under Compounds, Gender and sexuality, Language and food, Lexical semantics, Masculinity, Semantics. You can follow any responses to this entry through the RSS 2.0 feed. You can leave a response, or trackback from your own site.